I was very excited to find this single by Rosie Vela. Not because it contained any new tracks (both the A-side and the B-side are taken from her 1986 album 'Zazu'), but because of the sleeve and the fact that I didn't really know this single existed. Sure, I do have the 12" single so it was only logical a 7" single would also exist, but I always assumed it was only released in the UK and with a sleeve similar to the 12" single version. 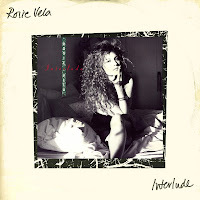 'Interlude' was another single to be taken from the album 'Zazu' by Rosie Vela. Like its predecessor 'Magic smile', the single contained album versions only. Even the 12" single offers no surprises: it only adds the track 'Tonto', also taken from the album. So why buy all this? Well, because of the sleeves of course. And to complete a collection. Everyone who has a singles collection will recognise this: once you've heard an album you like, you'll want to have all the singles drawn from that album. Well, at least, I do. So after buying Rosie Vela's cd 'Zazu' in 1989, I started looking for her singles. It took me some time to collect them, but I finally started to see things going my way when I found 'Magic smile', the first single to be drawn from 'Zazu'. 'Magic smile' reached no. 27 in the UK singles chart in January 1987. In other countries it didn't reach the charts. 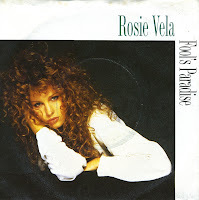 Despite her great music, Rosie Vela was discarded by many so-called 'serious' critics because of her modeling career. When you listen to 'Magic smile', it's obvious that the former model was mistreated in this respect. A lot of the records I've bought have been second hand. It's usually the only way to get hold of rare old singles. The second hand market is full of great finds. 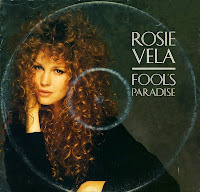 Having discovered Rosie Vela in 1989, three years after she released her album 'Zazu' on A&M records, I was very glad when I found the 12" single of 'Fool's paradise' somewhere in the 1990's. Unfortunately, as you can see, it was far from a pristine copy. It lay in a Record Exchange in London for only 30p, and despite its desperate state, I had to buy it. Not only for the remarkable sleeve (which you'll agree is pretty beautiful if you ignore the wear and tear), but also for the exclusive 'new 12" version' that was on the B-side of this record. The A-side consisted of the album tracks 'Fool's paradise' and 'Interlude'. 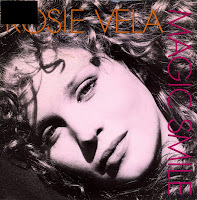 Rosie Vela was a model who got into singing and had the amazing good luck to have her debut album produced by Steely Dan's Gary Katz, with musical contributions by Donald Fagen and Walter Becker - five years after Steely Dan disbanded. 'Fool's paradise' was the third and last single to be released from 'Zazu', and like its predecessor ('Interlude') didn't reach the charts anywhere in the world. Rosie remains best known for her debut single 'Magic smile'.